To be completely honest, I’ve been procrastinating a bit on this week’s post. A lot has been accomplished in a short amount of time but in my mind, at least, pictures don’t show very well all that has happened. I spent most of the morning doing random tidying throughout the room, which is a sure sign that I’m putting something off. But here we are in Week 5, which has presented a few challenges for me; the main two are the weather (it has been rainy and humid and therefore, not ideal for painting), and the fact that we headed out of town for a fun weekend with my brother and sister-in-law. If this is your first visit, thanks for stopping by! You can catch up on my experience so far with the One Room Challenge here, or visit Calling it Home to see what the other participants are up to (there are nearly 200 blogs to choose from!). We took back roads most of the way there and passed so many beautiful sights. Make shopping list for and successfully navigate trip to Ikea with the Mister. Mission accomplished! We visited my brother and sister-in-law over the weekend, and there is an Ikea about 20 minutes from their house. We actually all went together, which definitely helped keep me on track – I probably would have wandered a bit more and wound up picking up extra things had they not been there. And they picked up a few things as well, including a new chair. I worked really hard on the shopping list – making sure that any item we were interested in was on it so we could keep up with what we should look at and what we should just walk on past. As we progressed, I crossed out the items we had eliminated and checked off the ones we had successfully picked up. It would have helped if we had picked up a buggy at the beginning of the trip… Our arms got a little full by the time we arrived in the warehouse section (especially after I picked up about 8 photo frames, half of which were quite large), at which time we were able to grab two flat carts to put everything we had already picked up AND the two Kallax shelf units that would become the base for the new giant craft table. This list guided us through our first major trip to Ikea. We carried everything you see on the first cart with our own bare hands until we got to the end! Assemble new giant craft table! My first task on Monday was to assemble the new Kallax shelves, which was quick and easy. The first took about 20 minutes and the second one took 7. It actually took just as long to take them out of their boxes and organize all the pieces as it did to assemble them, so the total time to get both shelves put together was about an hour. As soon as the shelves were together, I went over to the other side of the house to grab the desktop piece and put it in its place. That’s as far as we’ve gotten so far on the giant craft table. I did give the tabletop a light sanding and a fresh coat of white paint; it has gotten some stains and splotches of paint on it over the years, and this was an opportune time, with it being completely free of ‘stuff’. We also bought little legs to put it on, so it will ultimately be about 6” higher than it currently is; the top also needs to be secured to the shelves. It’s really starting to look good on this side of the room. I’d love to get that new window unit off the floor, though! This task is complete, with a few exceptions. I have packed up the sewing machine and all the supplies – thread, scissors, pins, etc. – but they are waiting in the dining room for the pegboard to be hung and the paint to dry on the sewing desk before comping all the way into the new office. The room isn’t really this yellow! I took this photo at night, and the overhead light does terrible things to the color in here. This is a truer representation of the yellow. Look how empty the room is getting! Paint pegboard and sewing desk. Pegboard has been painted! It’s awaiting its new frame, and then it will be hung. The sewing desk has been majorly transformed but is not yet complete. It has been SO HUMID here this week that paint is taking forever to dry, even inside. Spray paint is really out of the question, but I pushed it a bit with the pegboard, giving it a coat then very carefully carrying it into the laundry room where the humidity is lower than in the garage. I decided to spray the pegboard instead of brush or roll paint on (to minimize drips), so I found a spray paint as close as I could to the color of paint I already have. They’re not different enough to worry about, but the spray one is definitely a bit bluer. I did the same for the sewing desk; I sprayed the insides of it with a bit of navy spray paint so I wouldn’t have to worry about getting up into the insides with a paintbrush. Since the desktop will be open most of the time, I didn’t want wood color to show through from the inside, and the navy spray paint did the trick. So much easier to spray this section than to brush it! This, too, dried in the laundry room. Those gallon jugs are leftover from when we had no potable water for a week during the flood. I will definitely be painting both filing cabinets at some point; the black doesn’t work with the navy desk! My current thought is that the aqua would look great! I was excited to find a match for the filing cabinet we already have in great condition and really cheap at the thrift store last week. The picnic basket belonged to our neighbor’s mother and currently holds clothes that need to be taken in or mended. Here’s a close-up of the new knobs and paint! Purchase new light fixture, fans, and wood for peg and bulletin board frames. We went to Lowe’s to make our purchases the other night, but it turns out that the location closest to us does not have the same selection of fans as another one a few minutes farther away, so we will buy our items tonight on our way to trivia! The Mister learned quite quickly exactly how picky I am when it comes to selecting a ceiling fan (I was a bit shocked at how many of them I absolutely hated). I looked at the store across town a few weeks ago, and they had more options similar to what I like than our location does. The extra two days also gave me enough time to do the math for the wood pieces we’ll need to make frames for the pegboard and bulletin board, so we’ll be able to get everything on one trip. This was a half success. It’s been quite rainy, so we haven’t walked much. Rocky refuses to go out in the rain. Pipsqueek loves it; I, on the other hand, don’t love the way Pipsqueek smells when he comes in from the rain, so we’ve been confined inside. We did walk both Saturday and Sunday with my brother, sister-in-law, and their dachshund, Shenanigans, so there’s a small victory. They currently seem pretty content in their fortress of soft things. This was the first of the surprises that I had up my sleeve for the Mister. He used to like taking a quick darts break when he used this room as an office before it became a junk space, so I really wanted to figure out a way to keep it but to also make it look like it belonged. I think the painted bulletin board as a backing helped accomplish that goal! This was quite an easy project, and I’ll share more about it in a future post. Big bird and Steve Urkel helped…? 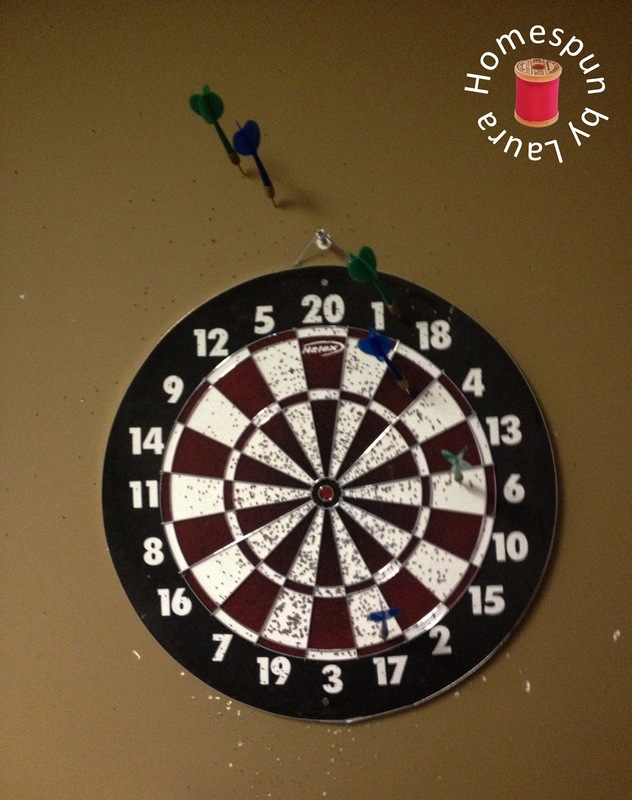 …And watched our first round of darts on the new arrangement! We definitely made up our own rules; I should look up how it’s actually supposed to be scored. I organized the clothes on my clothes rack! I needed an easy, complete-able organization task last night, so I removed all the clothes from their various unmatching hangers and put them on the new turquoise felt-covered hangers I bought at Tuesday Morning a few weeks ago. There were enough to go around, with one left over! It looks so much better now! Plus, it felt great to see even such a small task through from start to finish since all the other tasks keep getting delayed. I painted the mini door! It needs another coat; even after two coats of primer and two coats of white paint, the darkness still shows through in a few places. I wouldn’t recommend sitting in this chair during a darts game. You might catch a dart in the face! 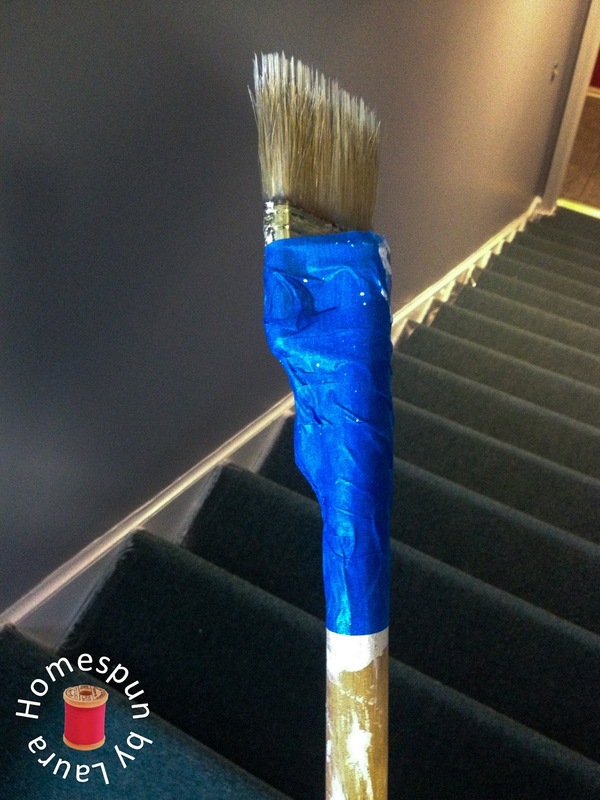 I finally painted the slanty section of the staircase! I felt like Kristen Wiig’s tiny-handed character on Saturday Night Live (but without all the weird comments) as I painted. It was very clumsy and took a while, but it looks much better! 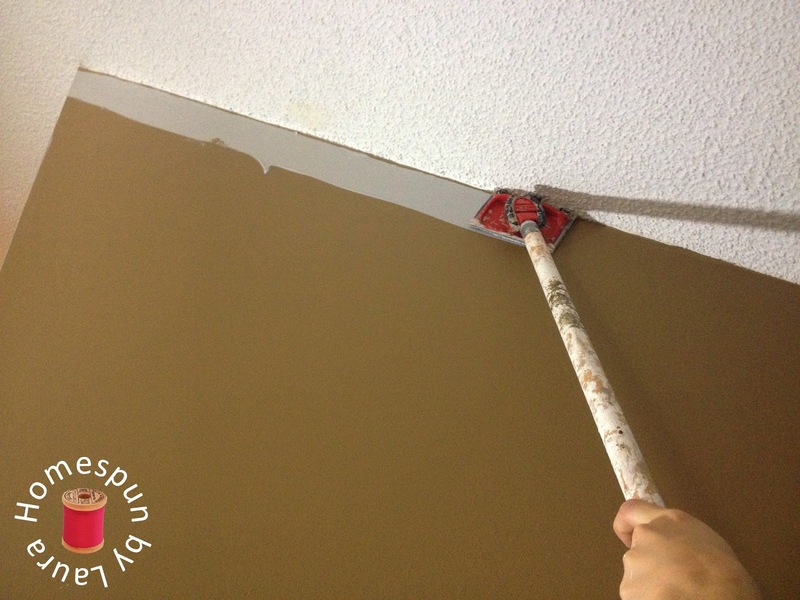 My special gadget didn’t get the job done; it left a gap of ugly brown at the top and globs of gray on the ceiling. This took ages, but it worked! Paint walls and built-ins, stair rail and hardware. Stain stair rail; spray paint hardware (we’re in for more rain, but hopefully the humidity will drop and I’ll be able to check this off! Regarding the clutter…lots of it is gone. Some of it is still in the room, but better organized. Some of it has just been sent to other areas in the house and still needs to be sorted through. Create display for race bibs and running awards, books, scouting accomplishments, etc. The display for our running awards is complete, but I still have work to do on our Boy & Girl Scout award displays. I bought most of the frames for this at Ikea over the weekend; the exception is an oblong frame for the Mister’s Order of the Arrow sash. All the furniture is in the room, even though there is still work to do on a few pieces. The plant stand I mentioned in week 1 is on hold for now; until the new window unit is installed, it’s parked on the floor under the window, so it will be too cluttered if I even try to bring anything else in here for now. Craft supply storage is looking good so far: The refashions are on the closet rack, the pegboard and big bulletin board are in progress, all my fabric has been relocated to its new home on one of the built-in shelves. The new craft table is in place, though not completely assembled and therefore, not really being used to store anything, and the rolly cart from Sam’s has been serving as temporary storage for painting and office supplies. These items are just waiting to find their real home. It’s looking a bit crowded here! Update fixtures: New fans and light fixture. New window unit. The finishing touches that are likely to be completed in the next week are: hang new frames on the walls. Said frames may or may not contain photos or art at the time they are hung! And there you have it. It’s going to be a busy week! !